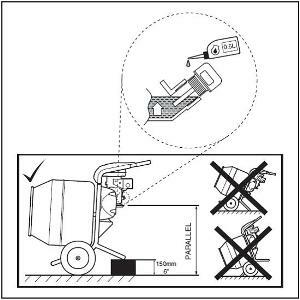 #Q1) Why will my Honda (GX120) Mini 150 concrete mixer not start? #Q2) Where can I find my serial number? #Q3) How do I arrange to send my Belle Product back for a Service repair? #Q4) Where can I purchase cement mixer spare parts from? #Q5) Do the mini 150 concrete mixers gearboxes come already filled with oil? #Q6) What type and grade of oil is used in the mixer gearboxes? 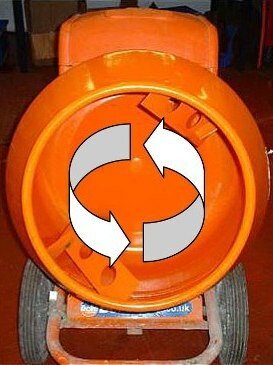 #Q7) How do I remove my Mini 150 cement mixer Drum? #Q8) Why won’t my Mini 150 concrete mixer switch hold in? #Q9) What oil goes in the Mini 150 cement mixer engine? #Q10) Why will my PCX Honda plate compactor not start? #Q11) What oil should I use in my PCX Plate compactor? #Q12) What size transformer should I use on my 110v BC350 brick saw? #Q13) How long is the warranty on spare parts? #Q14) How do you change feet on the RTX Trench Rammers? #Q15) Where can I buy a new concrete mixer engine? #Q16) Where can I buy a wheelbarrow, that I have seen been used on ITV's Love Your Garden? Q1) Why will my Honda (GX120) Mini 150 concrete mixer not start? Your Honda Mixer may not start due to the oil level in your engine, check your engines oil level in accordance with the below. Click Play below, to see how to fill your Honda Mini 150 with the correct oil level. Q2) Where can I find my serial number? All the machine serial numbers can be found on a black label or a metal plate located on the machine. Q3) How do I arrange to send my Belle Product back for a Service repair? Q4) Where can I purchase cement mixer spare parts from? Online 365 Days a year 24 hours a day. Q5) Do the mini 150 concrete mixers gearboxes come already filled with oil? Yes all the mixer range comes complete with oil already installed. Q6) What type and grade of oil is used in the cement mixer gearboxes? Q7) How do I remove my Mini 150 cement mixer Drum? The Mini 150 mixer cement drum will spin off anticlockwise as you look into the drum. Q8) Why won’t my Mini 150 concrete mixer switch hold in? This could be related to two things: - Incorrect lead length or incorrect volt supply. 230v Mini 150 – Your lead length should be no more than 30 Meters long and 2.5 mm wire size. 110v Mini 150 – Your lead length should be no more than 30 Meters long and 2.5 mm wire size with a transformer size of 2.2 KVA or more. Q9) What oil goes in the Mini 150 cement mixer Engine? The grade of oil should be 10W 30 mineral oil. Q10) Why will my PCX Honda plate compactor not start? Fuel - Incorrect, insufficient or contaminated fuel has been used. Unleaded fuel is the recommend fuel to be used in this model of machine. Low Oil level - Fill until the oil is at the marked level on the dipstick, If your plate still fails to start then check the oil level is high enough, as the oil alert feature on the Honda engines are quite precise. Q11) What oil should I use in my PCX Plate compactor? Q12) What size transformer should I use on my 110v BC350 brick saw? The transformer size should be 6 KVA or more. Q13) How long is the warranty on spare parts? Three months from date of purchase from Belle. Q14) How do you change feet on the RTX Trench Rammers? Changing the RTX Rammer feet is simple and easy to do. Check out the below video ~ RTX Rammer Foot Replacement Procedure. Q15) Where can I buy a new concrete mixer engine? You can buy a new mixer engine direct from ALTRAD Belle online 365 Days a year 24 hours a day on our spare parts website. All you will need to do is identify the make and model of your machine. Q16) Where can I buy a wheelbarrow, that I have seen been used on ITV's Love Your Garden? Most Altrad Belle stockist would have the Warrior Wheelbarrow available. Here at Altrad Belle we endeavor to answer all of your questions, however if our FAQ section has not answered your question. Please contact us on the below for further assistance.